For anyone looking for a luxurious home overlooking the Tom Watson golf course, look no further. South facing, with sun from dawn till dusk, our familys everyday stresses melt away as soon as we pull into the driveway. This is our second time renting this property it is immaculate, spacious and beautifully designed inside and out. You just dont want to leave it! Our kids love the themed rooms and the adults are spoilt for choice for bedrooms and luxurious bathrooms. The family loved the TV coming from the mirror in the bathroom! 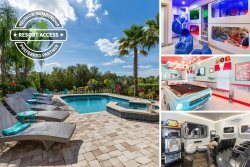 Reunion resort is arguably the best resort in Orlando, and arguably, this house is the best in Reunion! We simply cannot fault the house, the rental company and the enjoyment we all get from staying here. If you can afford that little bit extra, we would strongly recommend this house. Thank you very much for the opportunity to rent your home. We had a great stay, and are sure that we will be back again. Our stay in this home as been awesome. Only thing we would recommend is get the sink drains in some of the bathrooms fixed. They don't drain well and once they do the residue left is kind of disgusting. Also, one of the bathroom sinks in the room over the gym drips. Also, the dishwasher is not cleaning well, seems to be some black stuff in it. Other than that, we had a great time and a beautiful home and would stay here again. After spending all day at a conference to come to a home like this versus a hotel is beyond words. In fact we are looking to rent another house in Reunion for the last week of April for another conference. This is the best villa I have ever stayed in. The grounds are wonderful and great for going for a stroll. The house was well worth the money, its spotless, with a great pool and gym, plus a large balcony. The bedrooms are amazing too. Just a mile or two down the road is a large shopping store to buy any food and drink. The whole site is very secure with security guards at the entrance etc. Assistance for any problems was only a call away and they were very helpful. I would highly recommend this villa and would very much like to stay there again. We have stayed at The House for the past two years and have had nothing but wonderful experiences both times. The house is immaculate and very nicely decorated. Our children loved the pool, spa and games room. My husband loved the private fitness room & I loved the massage chair! The bedrooms are huge and have the most comfortable mattresses that we have ever slept on. The bathrooms are AMAZING! The Resort is about a 10 minute drive to Disney, and all the other attractions like outlet shopping are close by. Theres a Publix, Walgreens, Pizza Hut, gas station, & more just outside the gates of the resort. We've stayed at 2 other homes in Reunion before but they don't even compare. The pictures shown are nice, but do not do it justice, the rooms are a lot larger than they appear in the photos. The property and home were very clean when we arrived. The owner was available and always responded to my questions right away. I would highly recommend this property to our friends and family. Our family had the privilege of staying in your beautiful home and will be returning in 2012! We had stayed in Reunion before and could not help but notice this stunning home whilst on the golf course. We were so pleased to find it available to book and to say our stay far exceeded all our expectations is an under-statement. Everything is perfect, you and your management team were very helpful (we had lots of questions) and they were all answered prompty. Thank you again for sharing your home and making our vacation the best ever. Our stay at The House was perfect! The only thing that could possibly have made our stay even better is that the house was a beachfront house : ). Everything about the house was meticulously and beautifully decorated, every room was properly equipped and had everything we could possibly need during our stay. We love the location, we love that it backs up into a golf course and makes us feel secluded yet was accessible to all the conveniences. The pool was fantastic as this was favorite place kids spent their time. We loved the game room, the workout room and pool! We certainly would consider staying there again next summer! Thanks so much for allowing us to have such a wonderful stay at this beautiful and perfect home! We just returned from a week's stay at "The House." I just looked again at the photos on the website and have to say that they don't do the home justice! It is absolutely stunning--tastefully decorated, immaculate and comfortable. We loved the pool and game room, the exercise room and the spacious balcony areas. The Keurig in the Master Suite was a wonderful touch! We would highly recommend this home to anyone considering a luxury get-away!! Theme parks are just short drives and nearby restaurants deliver (we had Chinese and pizza!). One of our favorite destinations is Discovery Cove--highly recommended. We also enjoyed visiting Celebration for dinner and shopping.